Me? I’m okay…still giggling over the letter I got from the Social Security Administration. They’re terribly sorry about the loss of my father, but umm…could I send them back the meager amount they deposited in his account on the third of June? Awful sorry to ask, but you know he didn’t live the entire month of June so yeah we need that money back. If I thought I’d be able to remain civil I’d call, but I do know my limitations. Instead I’m going to send back a letter and tell them I’m awfully sorry about their financial issues, but Daddy has exactly $169 left in his account, and his “estate” consists of a box of old photographs, so if they think there’s any money to be returned they’re sadly mistaken. I’m still awaiting the statements from the hospital…you know the ones that list all the charges and the “Amount Due” at the bottom? Yeah, those ought to be good for a few laughs for sure. Everything else that’s coming in I’m writing “Deceased – June 19, 2012” and sending back. I guess we’ll see if the government can get money from a dead person. Lord knows enough of them vote with the government’s blessing. …at 2:30 a.m. on June 19th, 2012 Daddy went home….finally, after over a week of suffering and fighting. So, now he gets to play basketball and baseball and visit with is mom, dad, brothers and sister who went before him. He gets to party with his friends that went before him, and most of all he gets to be the fun-loving man I knew before Alzheimer’s tore him apart the last two years. Free at last, free at last, thank God Almighty he’s free at last. And me…I am taking a break. I’ll be back in mid-July. But, don’t you forget about me ya hear? And tell all your friends to come visit my blog, poke around and comment on the things they like. For those of you wondering about my lack of presence lately…..
Daddy is in the ICU, acute respiratory failure due to aspiration pneumonia…. Between work and hospital, no time for anything else. And, my funny bone’s broken. In the meantime, I’ll be posting some repeats over the next couple of weeks. I apologize for the redundant redundancy, but these days I’m lucky to remember to put on pants before leaving the house in the morning. This Kinda Thing Reeaallly Gets My Goat! For years upon years my stepdad would randomly ask my stepsister, Mom and I if we had seen his goat. His ‘goat’ had a name – Eldessie – and he was forever looking for it. But the most embarrassing time was my first date…ever. Fortunately, for me, he was also amused as ‘date’ became ‘husband’ a few years later. 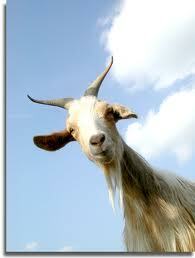 As for the goat, well Stepdad never did find it so one year for his birthday we gave him one. Not a real goat, we lived in a townhouse in the city and farm animals were frowned upon, no we gave him a small goat toy. He still has it and now it sits on the nightstand by his bed. Eldessie has finally come home. This is how I always imagined Eldessie would look if we ever found him...slightly amused, slightly annoyed. ….when my Alzheimer-riddled father makes no sense when he speaks. Truth be told, that’s most days. And then, the light flickers on for a moment and as I ready to leave the nursing home where he spends his days, lost in a fog, he speaks the only lucid sentences I’ve heard in months.. He will sometimes try to follow me out the secured doorway or hold onto my hand until both our arms are stretched to their limits. And the light flickers out again, the connection broken, he turns to shuffle down the hall – alone in his world, lost to mine.